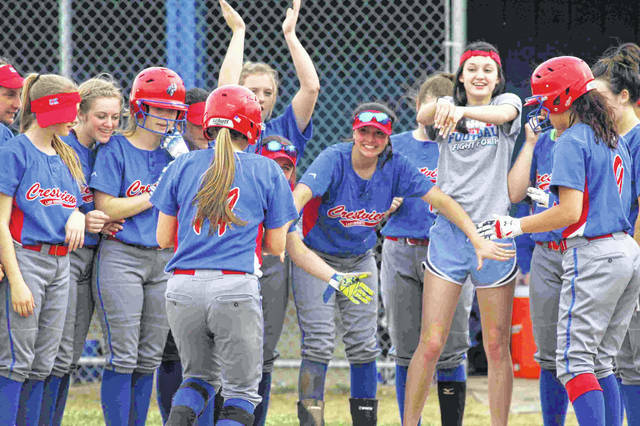 Crestview’s Lexi Gregory is greeted at home after hitting a solo home run in the second inning of Thursday’s game at Allen East. 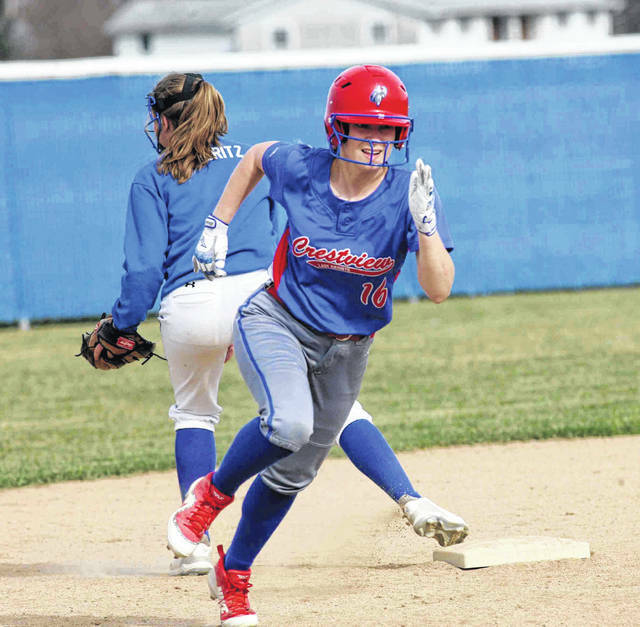 Crestview’s Olivia Cunningham rounds second and heads to third during Thursday’s game at Allen East. 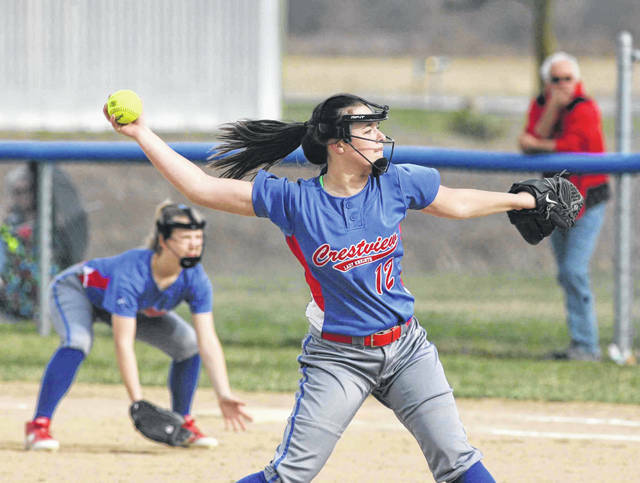 Crestview pitcher Kali Small fires one home. The Knight hurler limited Allen East to four hits in five innings Thursday at Allen East. Crestview’s Lexi Gregory heads to third during Thursday’s game at Allen East. HARROD – Crestview was run ruled Monday by Bluffton, 15-5, and Knight head coach Carl Etzler described the loss as a punch in the gut. But on Thursday it was Crestview doling out the punishment in defeating Allen East 12-2 in a five-inning run-rule contest. The win gives Crestview a 7-3 overall mark and a 2-1 mark in the Northwest Conference. The loss drops Allen East to 2-1 in conference action and 7-2 overall on the year. From the opening frame, Crestview came out hitting and roughed up Allen East ace Olivia Lawrence for six runs in the first frame and another run in the second to give Crestview a 7-0 lead after two innings. The normally reliable Lawrence struggled with control and a couple of Mustang fielding errors did not help her cause. Lawrence finished the game giving up 12 hits while striking out two and walking three and hitting one batter. The seven-run cushion was more than enough for Knight pitcher Kali Small who scattered six hits over her five innings of work. The sophomore righty , who improved to 5-3 on the year, struck out six and walked one. The lone blemish on her solid outing came in the fourth inning when she gave up two runs on two hits and a walk. 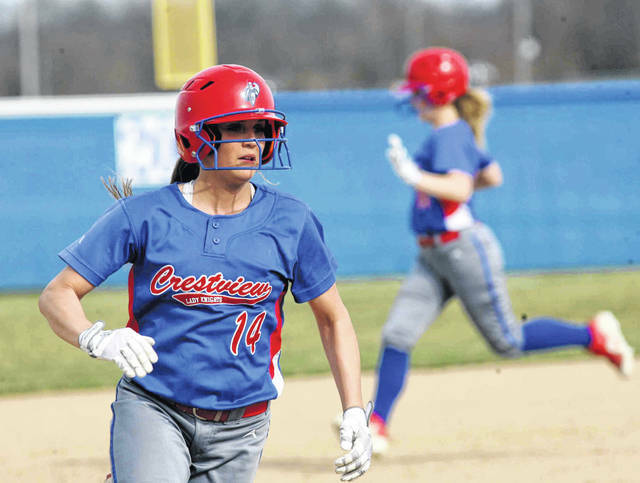 Crestview had little trouble scoring after lashing out 12 hits. Leading the charge was Lexi Gregory who went 3 for 3 with three runs scored and two RBI. Codi Miller went 3 for 3 with three RBI and two runs scored and Hannah Binion drove in three runs on a double in the first inning that highlighted the big first inning. Bailey Gregory, the lead-off hitter went 2 for 4 with two runs scored. This entry was tagged alleneast, crestview. Bookmark the permalink.